I've made classic lasagna, veggie lasagna, lasagna rolls, spicy lasagna, chicken lasagna...etc. But, I wanted to go back to the basics. I wanted to see if I could make it without a recipe--so, I knew I had to keep it simple. I started with tomatoes--red, juicy Roma tomatoes. Of course, I had to add a little garlic. I drizzled a little EVOO on those babies and gave them a healthy sprinkling of Italian spices and sea salt. And I roasted them. Until they were wrinkly, oozing, and aromatic (something about that phrase doesn't sound too appealing! )...but, oh, they were! I gave the tomatoes and garlic a good spin in the blender until they were nice and smooth. Yum! Now for putting the lasagna together. 5. Add another layer of noodles and the remaining ricotta mixture. 6. 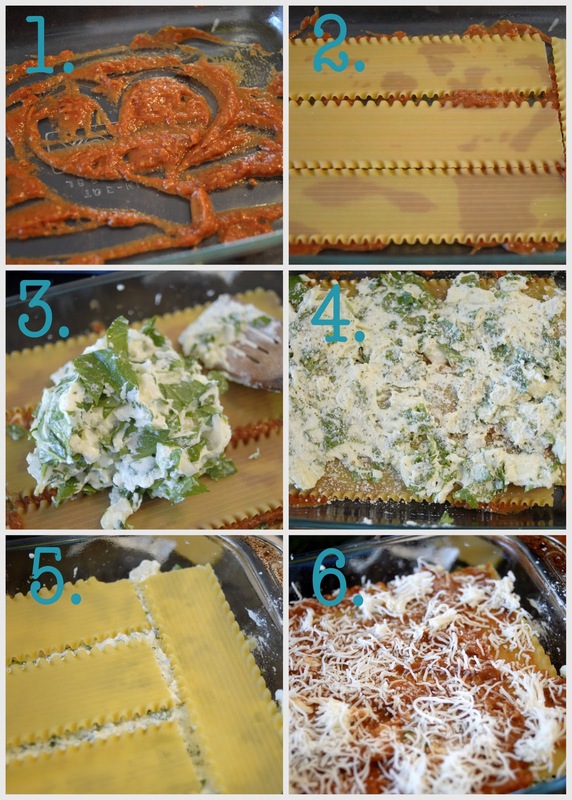 Add one last layer of noodles and douse them with the remaining tomato sauce and sprinkle with mozzarella and Parmesan. Bake it and eat it up! Cut Roma tomatoes in half. 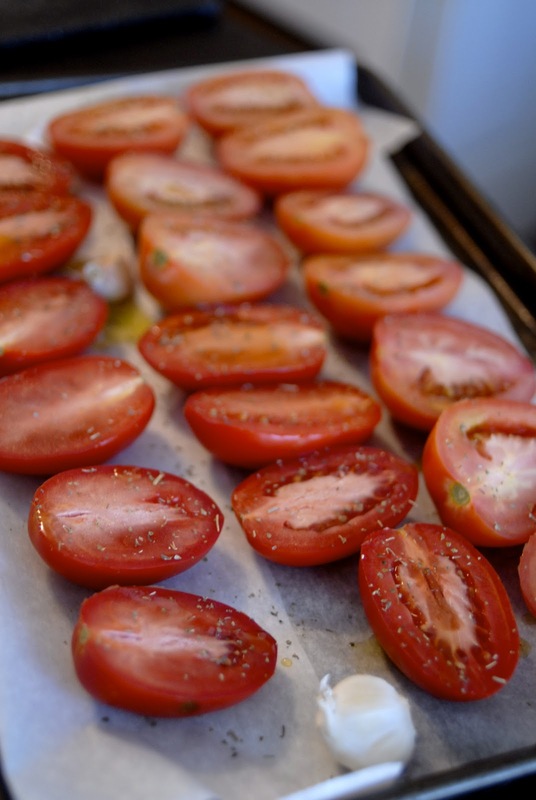 Place tomatoes and unpeeled garlic cloves on shallow baking pan or dish. Sprinkle with olive oil, Italian seasoning, and salt. Roast for 30 minutes (remove garlic). Roast tomatoes for an additional 15-20 minutes (remove them when they are nice and dark on the top). 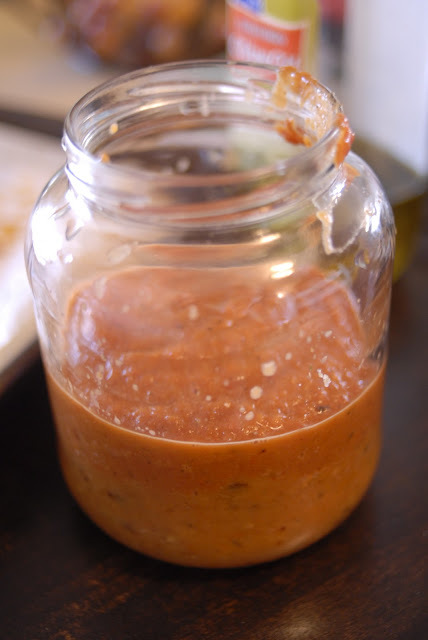 Remove the outer covering on the garlic cloves (it should be soft inside) and blend them with the roasted tomatoes until they are nice and smooth. In a separate bowl, mix together chopped spinach, onions (saute a little if you don't like crunchy onions! 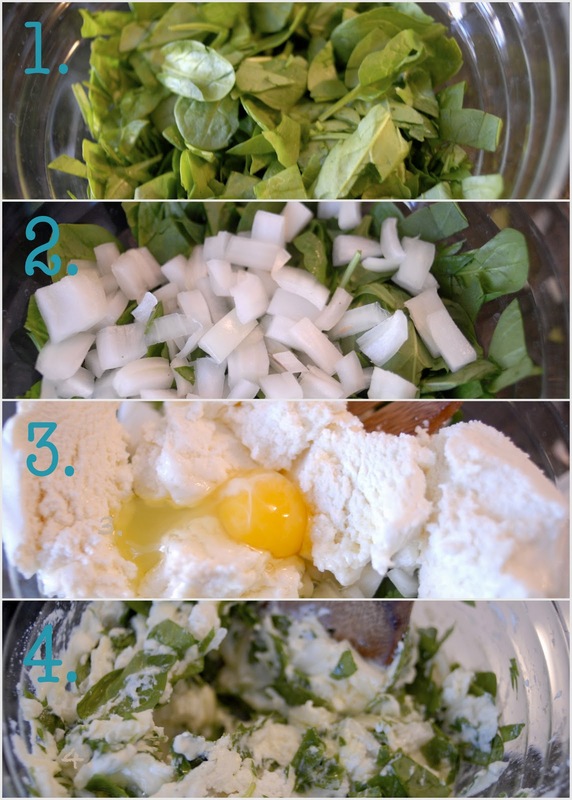 ), eggs, and ricotta cheese. In a 9x13 baking dish, place about 1/4 cup of the tomato sauce. Add a layer of noodles. Spread ricotta mixture over noodles. Sprinkle on a little Parmesan cheese. Add about 1/4 cup of tomato sauce over the ricotta mixture. Add another layer of noodles, ricotta mixture, and Parmesan. Add one last layer of noodles and add remaining tomato sauce to the top. Sprinkle with mozzarella and remaining Parmesan. Bake at 350 degrees--15 minutes covered and 15 minutes (or until bubbly) uncovered. Eat and enjoy! How do you like your lasagna? 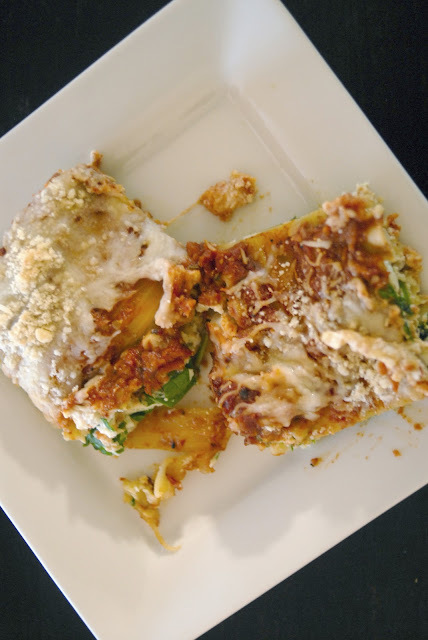 Yummy and comforting - perfect for this weather!